With the themes underway and the agenda set, it was time to start experimenting with our ideas. Over a rapid week- long design sprint, our ‘sprinters’ formed mixed teams, clustering around topics of shared interest. In just a few days they had to research their topic, observe the spaces and places they wanted to explore, find and interview users, develop ideas, build initial prototypes, test them in the real world, capture learnings and then prepare a vision for what the idea could become in its next iteration. Some of the loneliest people are at home all day, through circumstance eg. working from home or caring for young children, or because of poor physical or mental health. In Tandem wanted to explore ways to help people at home connect together outside. During their research in West Walworth, they identified local community garden groups interested in socially-prescribed gardening activities, and found many local spaces and places for lonely people to connect. But there wasn’t much information about how to find those spaces or who to connect with. Building on the Kick Off event insight that to access hard to reach people you need to go where they go as part of their routine, the group designed and prototyped “a facilitated well-being walk” from the GP surgery to local community gardens and spaces. The walk was co-designed with members of the community and trialled with residents, who expressed pride in their community spaces and were keen to enjoy local nature and heritage. Patients at the GP surgery were interested in the idea of facilitated walks as a way of getting out and meeting people, and our vision is for regular lunchtime walks from the surgery, supported by maps and signage and hosted by volunteers who can introduce people to the community gardens. Even a small intervention like this is enthusiastically received. Reports of student mental health issues have increased fivefold in the last decade, and this group wanted to explore how student accommodation design could tackle loneliness. 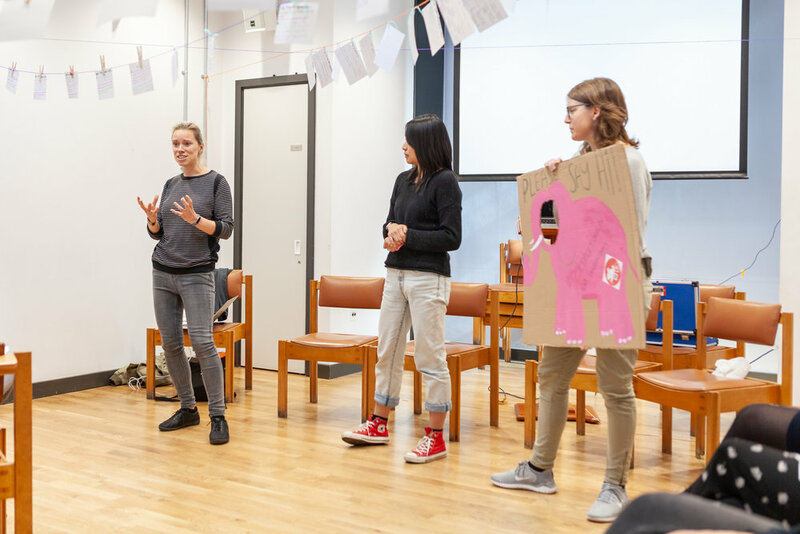 To ensure the prototype was student-led, the group visited universities and halls across South London, interviewing students about loneliness and mental health. Students shared that halls could feel isolating, sterile and unwelcoming, and that whilst they had a strong appetite to make halls feel more cosy, communal and friendly, cost, safety measures and management rules often made it difficult. User co-design unlocks the answers quickly and gives a powerful sense of agency over spaces. Despite loneliness being a widespread issue, the stigma around admitting it means that, far too often, people don’t reach out for help, even to their closest friends, family and colleagues. This is particularly true of young people, who, according to recent research, are by far the most affected. This project group set out to tackle stigma in two ways - by highlighting that loneliness is an issue that can affect everyone, and by using artistic storytelling to get Londoners talking about loneliness. They created an immersive art gallery experience, combining portraits of lonely Londoners with audio interviews. Members of the public were invited to take headphones and listen to these stories. This encouraged them to open up about their own experiences, and the feedback was really positive. People said they were grateful for the chance to talk and were surprised how much better they felt for sharing their story. They were reassured by hearing and seeing other people’s stories of loneliness, and felt a sense of shame had been lifted from them. Don’t wait for permission, funding or the perfect idea- the prototype gallery took a few hours to plan and create and was set up in-between two shops on a busy street. It worked! Loneliness really doesn’t discriminate- the group were surprised by just how diverse the stories were in the short space of time they were on the street. Gathering 100 stories of loneliness in London, representing every borough in the city, and sharing insights with policy-makers and practitioners at a public launch. Elephant and Castle is an area of London experiencing rapid change. It has new and existing communities living side by side, but with limited interaction. We know that transition times are when people can feel really lonely, especially when moving to a new area. The group set off by interviewing residents and discovered that many of the ‘newer’ residents used the area as a base to get to other parts of London quickly, and didn’t feel a sense of belonging to Elephant and Castle. In comparison, existing residents have a real sense of place. The group designed and tested a campaign, Elephant Says Hi, to help create a sense of belonging in the community, and to connect all residents with spaces, places, groups and activities across the borough. Early feedback was positive, particularly with local retailers. Their vision is to create a grassroots campaign led by the community to encourage all residents to feel at home in Elephant and Castle. There is huge value in co-designing with the community - in this case, retailers and residents had really valuable insights, and are likely to be engaged more if they are brought on the journey. Prototype with pilot retailers, groups, spaces and places and get user feedback. This group explored the role of everyday interactions between strangers as a way to combat loneliness and isolation. They focused on public transport, typically an anti-social place, but somewhere many people interact already on a daily basis. Using craft, they tested the role of small acts of disruption to facilitate conversations between strangers. The craft they choose was simple and accessible, from colouring in, to folding simple origami and cross stitch, and then encouraged people to pass them on as gifts, creating more opportunities for conversation and connection. The feedback was extremely positive, with many commenting that the intervention had ‘made their day’. Their vision is for craft kits to be shared on tubes and buses, and for crafting and interaction between strangers to become normalised on public transport. Need a low barrier to entry - e.g., colouring in. Crowdfunding campaign to cover cost of kits and training volunteers. Apartment buildings offer so much potential for community - but modern design features such as fire safety doors, lifts, security entrances for each floor, and restrictions on use of communal areas for things like washing and plants, mean that all too often neighbours never even see each other, let alone get to know each other. This group explored how to use small design interventions to nudge neighbours into connecting and meeting. They prototyped an initiative where each day neighbours were asked to share how they feel using colour codes displayed in a communal lobby. The vision for this group is to trial more interventions like this one, make a playbook for apartment designers and also scale up ideas across new developments in London. Share learnings with other developers and designers. There are many residential areas and streets with under-utilised spaces, from pocket parks to the undercrofts of buildings, that could be places for connection. But all too often they are places that feel neglected and unwelcoming, and can even foster fear. This group spent four days experimenting with the undercroft in Drapers Estate, a large covered area at the entrance to the apartment building. They interviewed several residents in the block about their lives, loneliness and how they felt about the undercroft space. The group then designed an intervention, delivering a yellow balloon to each flat and asking residents to write their story or a message to their neighbours. All the balloons were brought into the space, and residents were encouraged to read each other’s messages. On the final day, the group used large pieces of yellow fabric to amplify the messages and encourage more interaction. The project received generally positive feedback, with a call for greater engagement within the community. The group’s vision is to do further experiments like this one, both at Drapers and elsewhere, to explore how temporary installations can create connection, and to create a playbook for local authorities, architects and developers to incorporate into new and existing spaces. Cretae a playbook to use installations in other new and existing blocks and streets. Our cities are abundant with spaces created, in part, for the role they can play in fostering connection, places like libraries, parks and leisure centres. Yet these spaces often fail to serve the loneliest members of our communities. What if we reimagined their role as places for connection, and designed them with that in mind? This group explored the role of libraries as places for connection, observing several libraries in Southwark and Haringey to research how users currently connect in the space and experimenting with ways to make them more interactive. They tested small ‘hacks’ or ‘nudges’ to facilitate connection. For example, moving newspapers into coffee table style layouts to encourage people to read more socially, and wearing badges to give people permission to start a conversation. The reaction was positive with people connecting and conversing. They also researched other libraries and are sharing their learning with the government’s ‘Libraries Taskforce’. Their vision is to create a series of toolkits sharing best practice amongst local authorities, starting with a toolkit on libraries. There isa lot of value in collating and sharing what works. While technology is often cited as a driver of loneliness, particularly amongst younger generations, it can also play a valuable role in connecting those who are unable to leave their homes, or find it difficult to get outside as much as they would like. The group trialled the idea of ‘virtual lounges’ with a number of elderly and isolated users, using video technology to connect multiple isolated users and explore the role of these lounges in tackling their feelings of loneliness. They discovered that users wanted to actually do things on the calls and not just talk, such as attend a virtual class. The feedback from members of the community and from peoplewho work with the elderly and chronically lonely was positive.Their vision is a programme ofvirtual lounges trialled in 2019 in partnership with the British Red Cross and Kraydel. Prototyping doesn’t have to be as scary as you think - it can be as simple as sitting with someone and testing out a video call. Virtual webinars are being trialled in a Lendlease site to engage local care homes in the development of the local area. The group focused on East Street market in South London, formerly one of London's most popular markets. The market footfall is now in decline, partly because newer residents don’t shop there. Whilst initiatives have already been put in place to create community spaces in the area, they are not used, and new residents don’t feel a sense of belonging in these spaces. The group spent three days immersed in the market, researching loneliness and connection with market stall owners and shoppers. The group realised that shopkeepers were trusted, knowledgeable, and that they could provide the invitation needed to encourage participation in shared spaces.Over the next two days, the team took over a shop on East Street and encouraged locals to come in to co-create the space. Itbecame A Public Living Room andthey asked the shopkeepers to give invitations to passersby,telling them to come into the shop. Many locals responded and came in holding their invites, proving that shopkeepers are an important connector and should be community champions. Loneliness does not discriminate, anyone can be lonely. Ask larger retailers to help tackle loneliness by using their self-checkout systems to engage with their customers better, providing more information about local activities and community groups, either on screen or via a printed receipt.